The conceited blonde French occultist rides again! De Grandin is a Frenchman, small and blond haired with tiny feet. He is irascible and totally convinced of his own importance. He appears to be an expert in any type of monster hunting, from vampires to ghosts. He knows strange lore from many lands, having actually lived for a time in such far-flung locations as Laos and Tibet. As a detective, he is a former member of the French Sûreté. The stories in this book happen to feature a colleague of de Grandin, the diminutive Inspector Renouard. According to an official list of Jules de Grandin stories, there is perhaps enough left for one more volume. I’m looking forward to it. I want to touch briefly on each tale. I try to give no spoilers, but a warning here soothes the folks who fear them! “The Chosen of Vishnu” deals with a Western woman who was raised in a temple in India. Upon escaping to the USA, she is tracked by devotees… Kudus for the marigolds! “The Red Knife of Hassan” presents the case of a woman’s body dredged from the bay. It sets in motion a battle with an ancient cult of assassins. “The Jest of Warburg Tantuval” concerns a man who plans devilry for his son and wife. It will be from beyond the Grave! Best in Book! 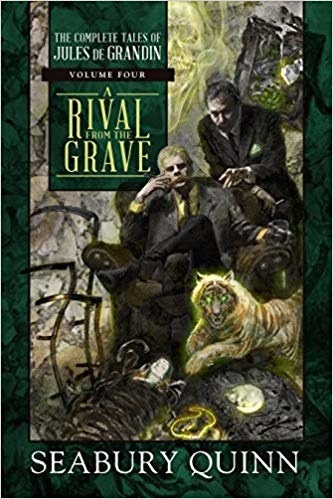 “A Rival from the Grave” involves a man named Frasier Taviton. When his wife passes away, he remarries. The event sets off a horrific haunting. Kudos for the use of x-rays! Who you gonna call? “The Witch House” tells the story of a young woman accused of witchcraft and drowned as punishment. After 200 years, another young woman finds herself in danger. What a strange little white kitten! “Pledged to the Dead” is about the graveyards of haunted New Orleans and a pale young lady apparently living there. Kudos for the snake! This book is great! The volumes are nice and look good on the shelf. I give it five stars and look forward to volume five!